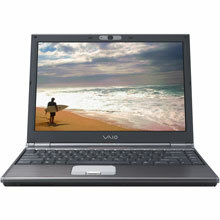 Bottom line: The Sony VAIO VGN-SZ370P is the second-best ultraportable, next to the LenovoThinkPad X60 (Vista), integrating an optical drive and discrete graphics into a 3.8-pound frame. Pros: Under 4 pounds with optical drive and discrete graphics. Dual graphics. Sleek design. WWAN modem built-in. Excellent performance scores. Cons: Mushy keyboard. The Cingular EDGE network it supports is too slow for the money you'd pay per month.